When growing up we have all heard our parents explain away something with the famous phrase “because I said so”. Many times this phrase is said out of love and protection, but as we all grow up our parents have started to explain the real reasons behind everything; that is what the students at PA are asking for. Every student realizes that there is a dress code and many are thankful for it, because of the code it takes away the worry of what to wear in the morning and matching the crowd. However, regarding specifics of the dress code, there are many different opinions. Many girls get very annoyed with the small rules that many regard as frivolous. “I think it is detrimental in how strict it is and the arbitrary way the rules seem to change. 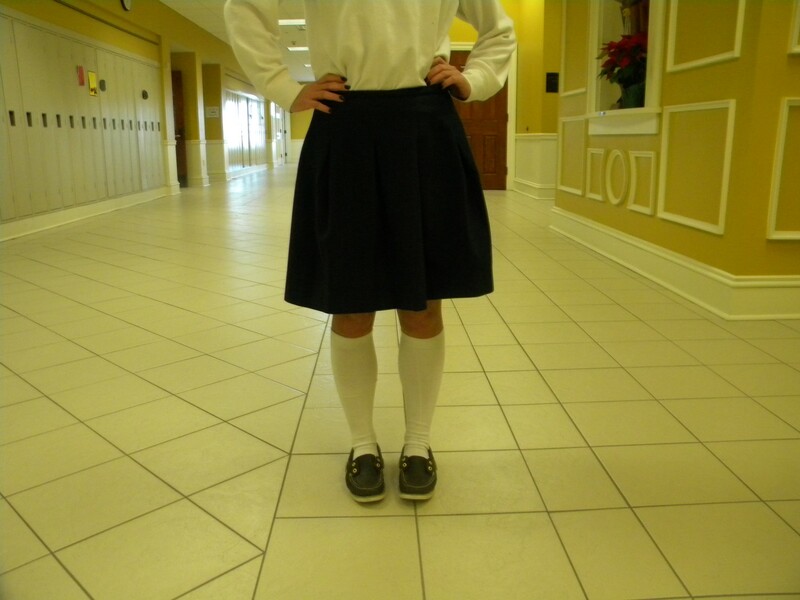 For example, the socks to the knee and the skirts to the knee- this is a rule that is either new or never enforced and it seems very arbitrary the way it came into effect,” Senior Mina McMillan says. While the overall goal of the administration is for the girls to be dressed modestly and make sure everyone does follow the exact rules, having three different Upper School directors in the past three years has added to the students’ feelings of confusion about the dress code. Each year the interpretation and enforcement of the rules has been different. In the past years the sock rule was rarely enforced, but this year a wide variety of girls have received verbal warnings for not having the correct socks or not having their socks pulled up. The change in who interprets the rules and how strictly they are enforced has changed and left many confused or irritated. Teachers also vary on their actual enforcement of certain uniform policies. The enforcement becomes even more problematic due to the sensitive nature of talking to girls about skirt length. Mrs. Ramirez said that she tries her hardest to make sure she pulls the girls aside to talk about the problem, rather than make it a public ordeal which can lead to embarrassment. However other teachers will make no attempt in hiding it, making the students feel awkward or embarrassed. The biggest frustration for the students is how much attention has been focused on the minor things. Other than the sock rule enforcement, skirt length has become an issue. 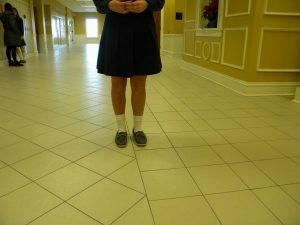 Many girls have difficulty staying in compliance with the skirt length, finding that their skirts are often just above their knees. “I just think teachers forget that we all come in different shapes and sizes and the uniform fits all of us differently. We should not be attacked if our uniform, which is modest in all forms, does not perfectly meet every standard. 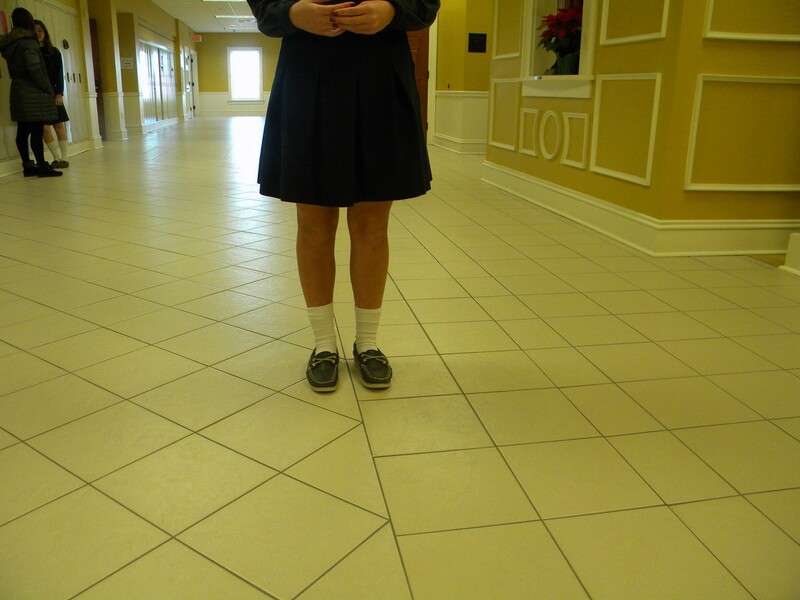 Uniforms are good and important but like anything can be bad if they are too rigid,” says Senior Olivia Mannella. Since the uniform policy requires a specific skirt, the girls are not given the freedom to wear different styles of skirts, pencil skirts or any other variety, that may fit their bodies better. 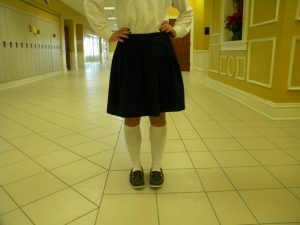 To correct the issue, many girls have been asked to purchase larger sized skirts so that they meet the mid-knee requirement. “The biggest problem is that the skirts that are longer are too big in the waist, so I have to roll them to keep them from sliding down, but then that makes them shorter,” says Senior Evie Kenney. It may appear that the students complain too much, or do not understand the rules; however, the majority of students do in fact understand but simply disagree. “I think the uniform enforces discipline, which can be good! However, if the uniform is overly enforced, it can also be somewhat demeaning and awkward for the students,” says Olivia Mannella. All in all there seems to be a miscommunication between the administration and students that could be cleared up with a conversation where both sides are willing to listen. The students like the benefits of having a uniform. It can help your grades and much more…but will having socks that reach your knee help students get an A? The common look…can you see the difference? very interesting! I love the different quotes and opinions. Well written article! I really liked how you got interviews from teachers and students on how they deal with uniforms. I love this article because this is one of the biggest issues our school has and Leah worked really hard on this and it is a really well written article.